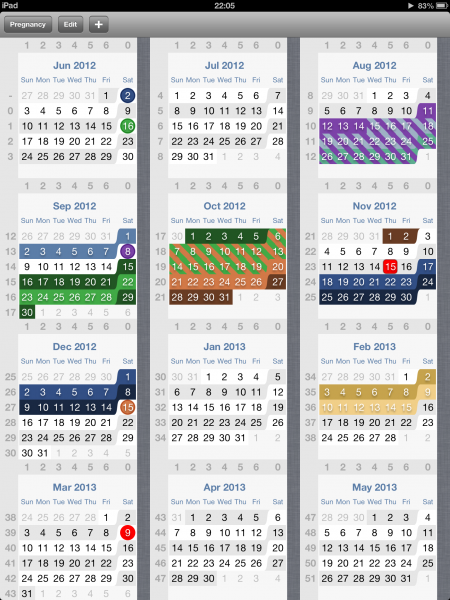 The Prenatal Dates is also wheelless. 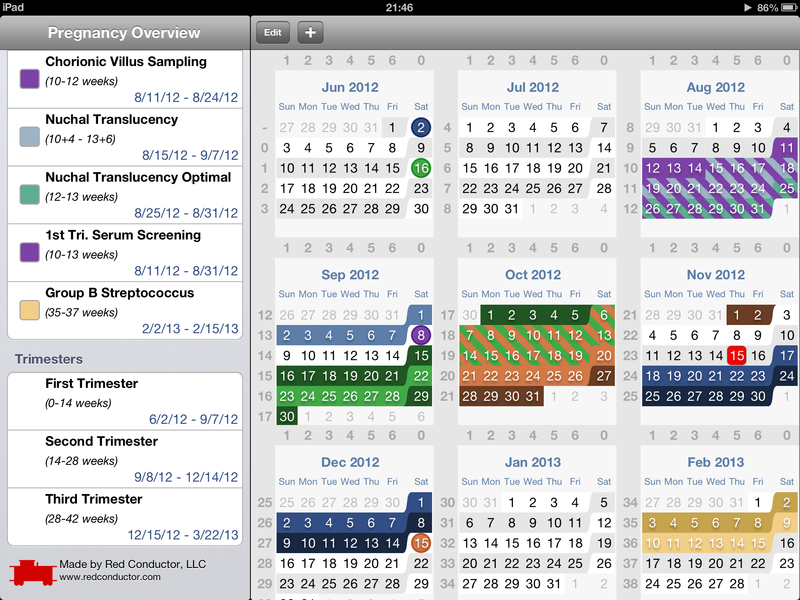 It makes up for this (if you are a wheel requiring provider) by providing a calendar of the pregnancy. 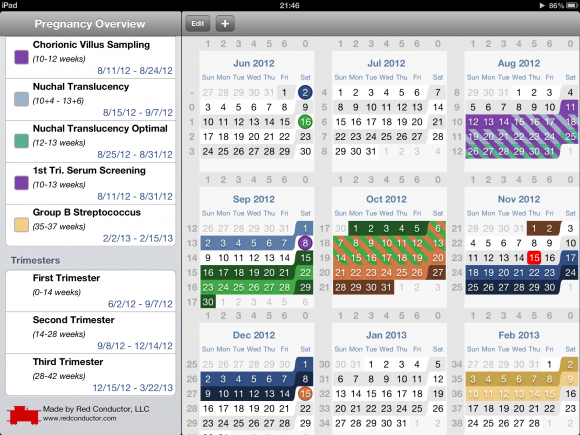 In the Pregnancy Overview section (left), there are several interesting sections. In the top left, you can “define” the pregnancy by LMP, EDD, or custom (i.e. stated EGA on a particular day). 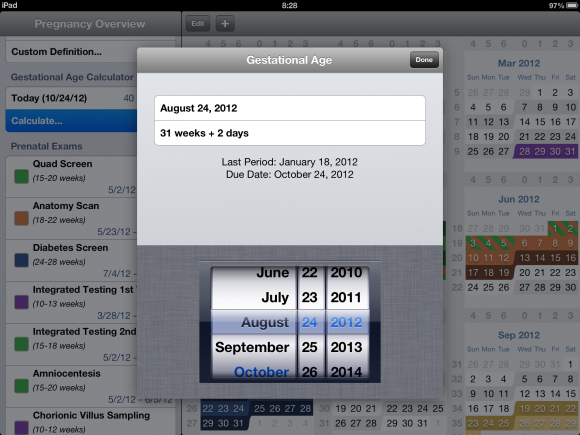 Just below, the app will calculate an EGA for date in question or calculate a day for gestational age. The bottom left of the app indicates trimester by weeks and dates. 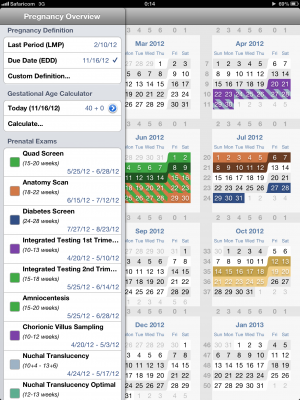 In between trimesters, pregnancy definitions, and gestational age characters, there is a list of color-coded prenatal exams (mostly screening exams). 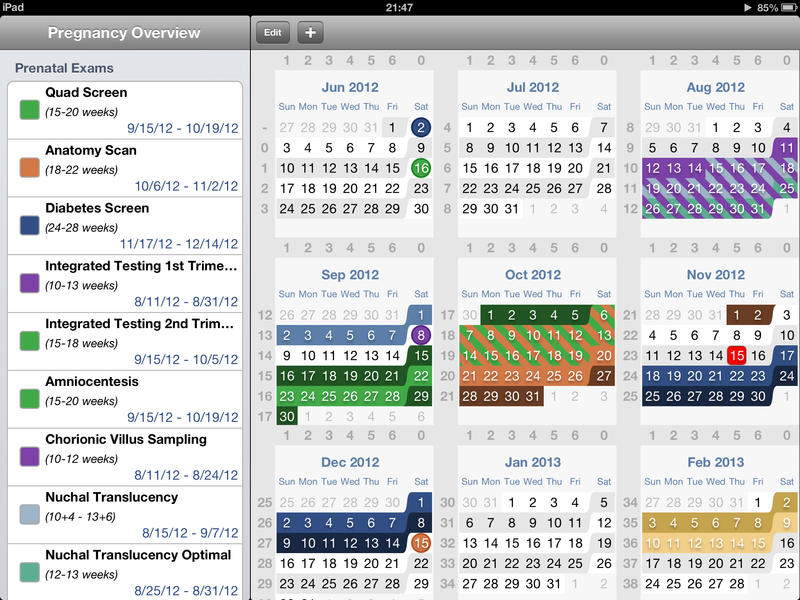 This list is accompanied by dates. The majority of the app screen is dedicated to a wall-type chart of pregnancy. For the more visual people among us, the color-coded calendar provided provides a feast of information and reminders. But like any feast, the richness can be a bit overwhelming. Additionally, the EGA guidelines for some of the tests are not as inclusive as they are in reality (i.e. the quad screen can actually be done through 22+6, not 20+0). The “Edit” and “plus” radio button options confuse me as they don’t seem to work differently from the pregnancy definition functions on the left. For me, I have most of these dating guidelines memorized, so the reminders may not be as helpful – I like the image that I can share with patients, as well as the list of dates a patient will be in a window for a particular test.